In order for you to have the best orthodontic treatment possible, your oral hygiene must be a top priority. Along with your dentist, we will assist you in oral hygiene education. Routine cleanings from your dentist office will be a necessary part of your orthodontic care. An appropriate dental hygiene routine will keep your teeth healthy and white. Your teeth are not the only important part of your mouth. Your gums are essential to oral hygiene as well. Keeping your teeth and gums healthy will keep teeth moving as well. Poor oral hygiene can actually lengthen your total orthodontic treatment time. Please let us know if you have any questions. When you get your braces on, we will go over a comprehensive list of foods and other things, such as biting your fingernails or chewing on pen caps that can cause damage or other problems. Your braces will not get you out of gym class but you should be more careful with your mouth, especially if you are athletic. A protective mouth guard is recommended for playing most sports, even soccer, to prevent your braces, mouth and teeth from damage. If you are injured, check to see the damage done to your mouth and to the braces. You should call for an appointment if your teeth are loosened or knocked out or if the braces have been damaged. What teeth look like after braces are removed if they are not properly taken of during orthodontic treatment. 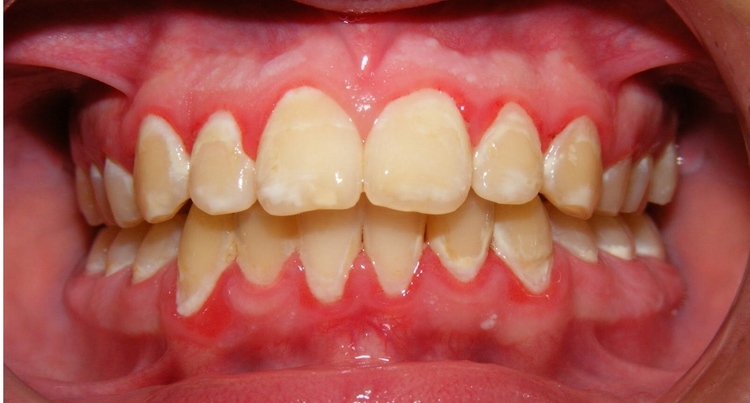 The "white spots" are areas where cavities have started.